Anthony Crolla knocked out Colombia's Darleys Perez in the fifth round to win the WBA lightweight title. After four cagey rounds, Crolla landed a massive left hook to the body that floored the champion, who could not make the count. Crolla, 29, was fighting in front of a raucous home crowd in Manchester after taking Perez to a draw in July. And his world title win comes less than a year after he suffered a fractured skull when confronting burglars. "It is an amazing feeling, it is a dream come true, now I just want many more nights like this in Manchester," said Crolla, who now has 30 wins, four defeats and three draws. "I've dreamed this dream since I was 10. I didn't know it was going to be this good. It is better than I ever dreamed it would be." 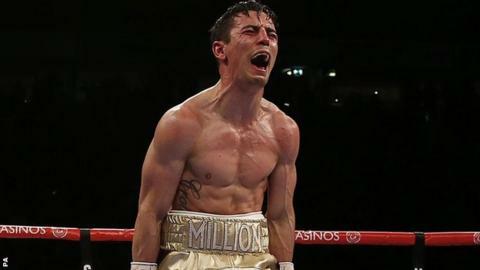 In December 2014, Crolla was hit with a concrete slab as he attempted to apprehend two men who had broken into the house of his next-door neighbours. He also suffered a broken ankle. He had been due to fight Richar Abril for the WBA title in January, but eventually got his chance against Perez in Manchester in July, failing to take the belt in a drawn decision after many observers thought he had done enough to win. But in this return bout, the result was in no doubt. There was little to choose between the two in the opening four rounds, though Crolla was moving well and regularly making Perez miss. Then, in the fifth, with Perez on the ropes, Crolla switched his attack from the head and nailed the champion in the side. Perez shook as his head as he fell to the canvas, remaining on his knees as the 10-count was completed, sealing only his second defeat after 32 wins and a draw. "I was very confident I would get him out of there," added Crolla. "I thought it would have been a head shot. I touched him with a right hand and sunk him with a left. "After the first fight I went away and worked hard with the team, we have worked so hard in the gym. I just have to thank the team around me. Joe [Gallagher, trainer] has turned my career around and so many people had given up on me. "I have come to this arena since I was 10 watching Naseem Hamed, Joe Calzaghe and Ricky Hatton. To do it here is what I dreamed of."